Even though I shall be taking rucksack on my trip there are lots of things that I shall need to have more readily to hand: my phone, my zoom lens, my moleskin, a pen or two, a map... It seemed a very long list. I obviously needed a lot of pockets and it occurred to me that the fisherman's vest was an ideal way of acquiring them. 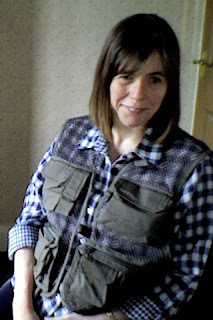 So the 'Orvis Clearwater Vest' came this morning and I feel quite pleased with it. I opted for the mesh version because this is supposed to be cooler than the cloth. It is designed for the travelling angler, but I think it will suit the travelling writer equally well. It has twelve pockets including a back pocket for raingear. The only slight problem is that the 'small' size is actually rather too large, but this does mean that it fits (easily) over my fleece too - so I think I might stick with it. It's certainly, erm, different Clare! My only real worry is that you feel it's a good idea to go out with a mole skin. Where will it end? Tiger skin? Polar bear skin? We need to know. Love the vest. Photographer's vests have lots of pockets too. One wonders, are you going to be writing about the Cornish population of 福建 ? Dear me, Brian - have you never owned a moleskin? Bruce Chatwin, travel writer extraordinaire (and one of my many heroes) swore by them. I have one now and I can see exactly what he means. Thank you, Nora. I didn't realise that photographers had vests too! I've doe a little search since your comment and they look quite similar. This is a relief because that is mainly why I wanted mine - to hold camera bits and pieces. Thank you Jud. It does look pretty well made, though I have no experience in these things. 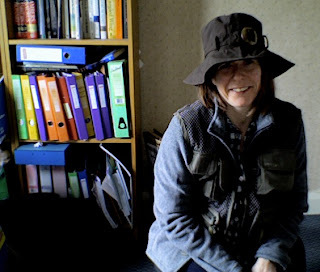 I looked at the hats, and yes, they are far more stylish than mine - but have only one disadvantage as far as I can see, and it is a major one - mine can be shoved into my case and it looks just as good afterwards as it did before. Not saying much I know, but it will keep the sun off a bit I hope. Why would you ever want to take a Stetson off, Clare? While on the plane it can be used to cover your eyes while you catch a nap and has a myriad of other uses. Yes, I'm sure you're right, Jud - but this is my new hat so I'd better wear it now. When you mentioned all the pockets, I couldn't help but think of Tolkien, and venturing away from the Shire with the One Ring. When I travel, I usually just wear a rucksack, but you are right that it can be inconvenient for things that need to be removed quickly such as cameras. I've heard somewhere a saying that if you serve someone a fish they are nourished for just a day, but if you teach them the logic of wearing a fisherman's vest with handy pockets for cameras and phones, their imagination is nourished for a lifetime. you look so cute in your gear!!!! Jabs, millipedes and grainy nylon sheets. An Interview with John Murray.